There are gazbillions (not a real number) of words online you could read to up-level your brand chops. You could pretty much take off a year from life to consume the lot. 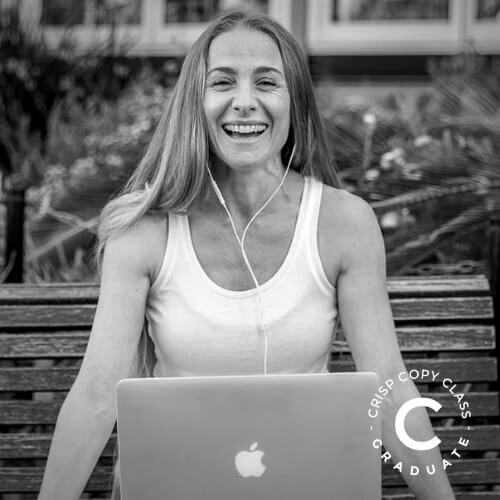 What makes Crisp Copy online copywriting courses the bomb? But it’s not magic. You just need to start with a brand voice. And there are no secrets to uncovering the darn thing, only an exponential growth in your capacity to have potential clients and customers fall in love with your brand. Add in some solid ideas for how you’ll structure your copy and you have conversion gold. And there’s no secret-squirrel, ‘buy this course then I’ll upsell you junk’ marketing ploy. Whether you invest in a quick downloadable or a 7 module online program with me, I teach you everything I can in the time we have available. This is the gold. 24 carat. Top notch. The shiznit. Evergreen access, multiple easy-as-pie to digest modules, videos, downloadables, and all things nice. How could you go past? Part training. Part community. Part brain-pick. The Crisp Copy Class is an online society of women in business wanting to write better to sell all their things. Expert lead Masterclasses, copywriting 101, step-by-step modules, live copy hacking, daily access (weekdays!) to Jay for your round, a vibrant Facebook pod (with the option to stay in the main group after your round), connections and accountability. This course has been created for women in business. From midwives to copywriters, from mortgage brokers to website designers, everyone in the deep end together (some with floaties and hey – there’s no shame in that) finding their brand voice, their copy personality, discovering their dream clients, and writing words that sell. Not everyone’s ready to bring on a quality copywriter to write their About page. 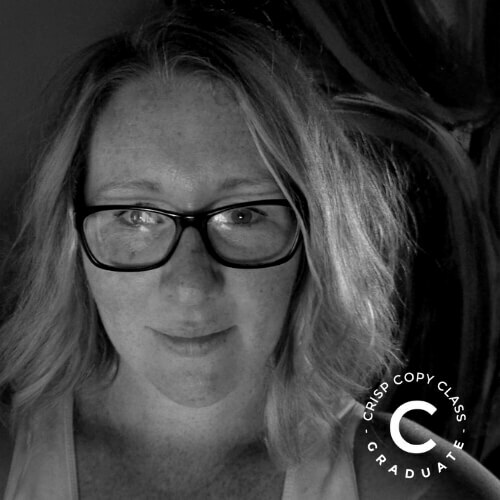 Maybe you’re bootstrapping and borrowing and breaking ground and building a startup and you can’t yet afford to outsource the lot to a copywriter who has proven her chops. Or you’ve been burned – spent a bit of money and hired someone who’s delivered copy that doesn’t sound at all like you and misses the very essence of your story. It’s for you this course exists. I’ll guide you through getting out of your own way, give you tips on how to fake it ‘till you feel it, and help you turn your backstory into a persuasive piece of copy. Simple dimples to follow, broken down into easy-as steps, and cheaper than a pub lunch. Got a whole lot of backstory and no real concept of how to bring it together for your website? Here’s a step-by-step visual guide with accompanying simple documentation to walk you through taking all that story and heart and turning it into something that’ll read well, be easily scannable, and move your ideal client through to the next point of the journey. Want to sell ALL your stuff? – a visual guide to follow for layout and structure. Got the ideas and the know-how but don’t know what your blog should include to get maximum conversion? Don’t know where your metatag goes or what a CTA is? This super simple, 5 page guide will show you where to put your blog words so they work for you. In the course of your business life, you’ll be asked for a biography about a thousand times a minute (well, it feels like that when you don’t have one). This template makes it hugely helpful – you really only need to write 2 sentences – at a time. You can then use your first bio to morph into whatever your biography requester needs without starting from scratch. Building a brand voice? Struggling with what to write above the fold on your website? This is a collection of 10 of the most common copywriting mistakes I see again and again. And again. Each fix will take you only 10 minutes! “I knew I could write, in fact, I make money writing copy for other people. But it wasn’t until I joined CCC that MY copy started coming together. During the course it was great being able to tap almost directly into Jay’s copy and business brain, no question was too stupid and her answers were always crystal clear.